My aim was to evolve Miele’s design language while adhering to the expectations of this well established brand. My corresponding aim was to design products that use the least amount of materials to produce and energy to operate while also demonstrating a sense of theatre when in use. Other work cannot be shared as they are in development for release. Render of a cooker hood that moves above the hob when turned on. 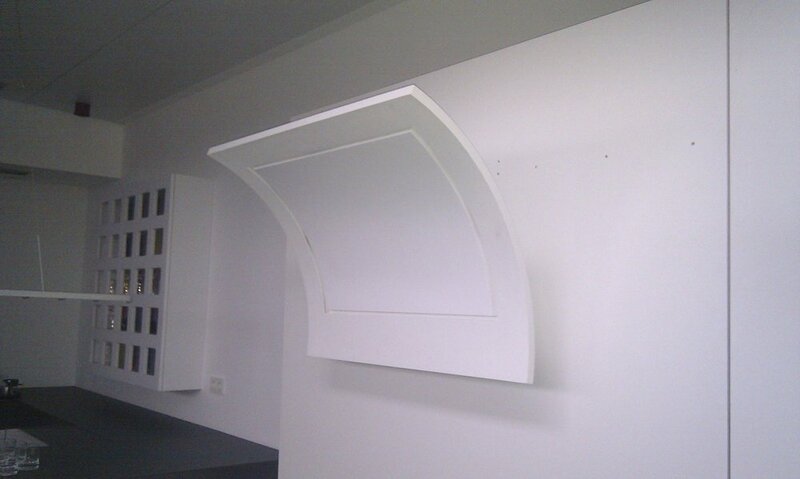 Physical model of cooker hood, refined from the previous render to have have a single square inlet for air extraction. Glass and aluminium cooker hood. Glass ellipse moves over the hob through motors in the aluminium section thats fastened to the wall. Air moves up under the glass canopy and air is filtered through the aluminium section that is fastened to the wall. LED lights built into an induction hob shine a temperature indicator onto pots when cooking. It is a nod to the traditional gas flame and provides for a more intuitive interaction with temperature. Iris aims to encourage users to lead more sustainable lives through the food they eat, as well as facilitating more interaction between people in the kitchen. Iris is a circular touch-screen unit that can be installed in any surface in the kitchen. Iris supposes that in the future, all food packaging will have RFID (Radio-frequency identification) tags. Iris can detect these RFID tags and display information about each food item, such as where it came from, its environmental load factor, nutrition etc, allowing users to discover the hidden history of the food they eat. The units circular form was intended to become a focal point of interaction, a modern day hearth in the home. Designed in partnership with Ian Slattery. IRIS won a design competition sponsored by Miele in 2010.